Is Hong Kong meeting the ‘best interests’ of all its children? Part of the new Lingnanian Opinion Column for HKET. Please follow link for full article. Article 3 of the United Nations’ Convention of the Rights of the Child states that “in all actions concerning children, whether undertaken by public or private social welfare institutions, courts of law, administrative authorities or legislative bodies, the best interests of the child shall be a primary consideration”. Few would disagree that childhood experiences have a profound affect not only on children’s current lives but also on their future opportunities and prospects. If some children in society systematically fall behind their peers in the core areas of their well-being, this should be regarded as a situation in need of urgent attention even if things are going well in other respects of economic and social development. Indeed, writers across the Social Sciences have suggested that inequalities are much harder to justify if they prevent children from having a fair start to life. For instance, the Heckman equation, named after the popular American Economist and Nobel Laureate, suggests that public investment in educational resources for very young children aged below five promises particular ‘good value-for-money’ as it contributes positively to their early development of cognitive and social skills. If sustained by means of high quality education through to adulthood, such investments promise substantial gains to the economy by creating a more productive and valuable labour force. Focussing on the positive freedoms of children and how their rights are being upheld in different contexts, the work of another Nobel Laureate and political philospher, Amartya Sen, argues that children’s chances to have a healthy start to live and access to high quality education to a large extent determines their capability to actively choose the lives that they have reason to value during childhood, adolescence, and adulthood. Indeed, since the economic circumstances to which children are born into are beyond their own control, merit-based justifications of inequality and ‘just deserts’ are less likely to convince if we are considering children rather than adults. In a recent discussion paper for the United Nations International Children’s Emergency Fund (UNICEF), Stewart (2013:13) suggested “the societal consequences of inequality are very different if particular individuals move in and out of poverty or riches than if everyone stays in the same place in the hierarchy”. In other words, persistent inequalities between the most advantaged and disadvantaged should be perceived as a case of ‘inequity’, i.e. a matter of fairness and social justice that governments and related stakeholders have a responsibility to address. This is particularly the case as far as children are concerned. Although there is a strong economic and moral case to prioritise children in the distribution of scarce resources in society, the harsh reality is that few rich economies have so far managed to create truly “fair” circumstances for all its children. As such, international evidence has shown that students from the most disadvantaged families still tend to be more likely to be among the worst academic achievers than their peers from families with the highest socio-economic status. Despite some positive overall gains, there remains a stubborn social gradient in healthy eating and physical activity in many rich countries meaning that children from the least advantaged family backgrounds continue to consume significantly less fruit and vegetables, and exercise less frequently for a total of at least 60 minutes per day as recommended by the World Health Organisation (WHO). Not least, the least affluent children across rich economies are more likely to have very low life satisfaction, which is associated with multiple risk behaviors including bullying and being bullied at school. There is a dearth of systematic empirical evidence that would allow us to very easily the extent to which the Hong Kong government manages to uphold the rights of its children compared with other rich economies around the globe. However, thanks to the Policy Innovation Co-ordination Office (“PICO”) (formerly the Central Policy Unit), which recently supported a cross-university research project on the Trends and Implications of Poverty and Social Disadvantages in Hong Kong, researchers are now in a position where they can begin to piece together the complex puzzle of child opportunities and prospects in Hong Kong. Although preliminary, the data collected as part of this research suggests that children in Hong Kong have a much higher chance to be among the least affluent if they grow up in a single parent household or in a household with no working adult. This finding may not be surprising, but speaks to the inability of the social safety net in Hong Kong to protect children from less traditional households from falling way behind their peers in terms of their income. The findings also suggest that rather than the level of education or combined salaries, it is the parents’ material deprivation that determines the likelihood for children to lack access to basic necessities, such as e.g. a personal computer or a place to study in the home. In other words, being born in disadvantaged circumstances still acts as a barrier for some children in Hong Kong to live the same life as commonly perceived as ‘normal’ by a majority of Hong Kong children. Previous research has shown that the parents and grandparents in less affluent households in Hong Kong make considerable sacrifices to facilitate the best possible start in life for their children. However, what these findings stress is that there is a threshold below which these adult family members are no longer able to shield their children from the negative consequences of severe material adult deprivation in the households they grow up in. Finally, there also appears to be a link between the material and mental well-being of children in Hong Kong. As such, it is a lack of access to basic child necessities that is more likely to cause very low life satisfaction and a disproportionately high frequency of mental health complaints, such as having problems sleeping, worrying a lot, having stomach and back pain, among Hong Kong children. These findings remain after controlling for their self-perceived family relationships, their connectedness to teachers, and even their experience of being bullied at school. Much more work needs to be done to fully understand the various ways in which the determinants of well-being of the most disadvantaged children are interconnected. However, what appears clear is that family background continues to play a considerable role for the life chances of at least some of Hong Kong’s children. As long as the future opportunities and prospects of those Hong Kong children continue to be determined by the ‘lottery of birth’, it is difficult to argue that Hong Kong’s economic and social policies rise to the lofty ideals of the United Nations’ Convention of the Rights of the Child. In order to more successfully meet the needs of all its children, the Hong Kong government is well-advised to subscribe to the policy advice of international bodies, which have argued not only that governments should strive to promote healthy lifestyles and improve the educational achievements of the most disadvantaged children, but also that the incomes of the poorest households with children need to be better protected. This may not be a popular view given recent statements by the Financial Secretary (Hong Kong), which were meant to dampen the hopes for more government profligacy in social protection moving forward. Given the dearth of comparative data in Hong Kong, it is also important to invest in further systematic research to enable better monitoring and measurement of child well-being in Hong Kong and its neighboring societies in the Big Bay area. Data sets that track the development of Hong Kong children across multiple dimensions of child well-being and across different life stages promise to be particularly valuable for generations of local policy makers and other stakeholders. 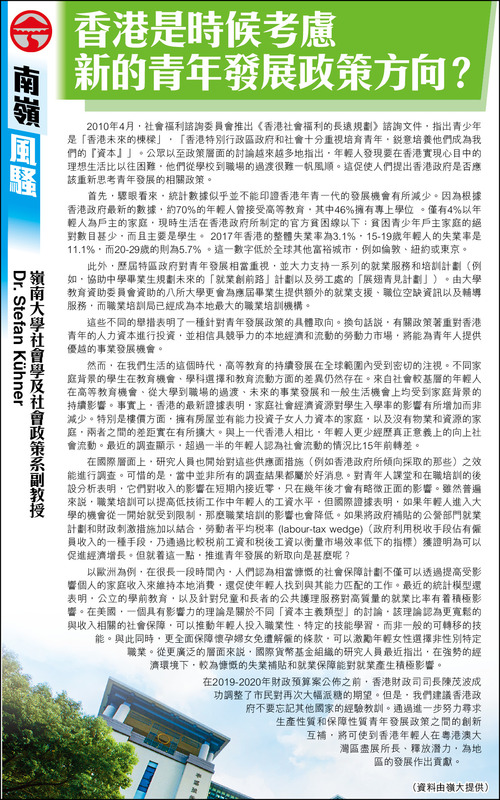 While there are very good reasons for the Hong Kong government’s recent emphasis on STEAM subjects and industries, it is equally important to recognize the continued role of the Social Sciences in better understanding and shaping the life chances of her children as the future pillars of society. Stewart, F. (2013) Approaches Towards Inequality and Inequity: Concepts, Measures and Policies. UNICEF Office of Research Discussion Paper. Florence, Italy: UNICEF Office of Research. This entry was posted in Uncategorized on April 3, 2019 by stefan-kuehner. Shifting monetary policy by the US independent central bank; the fear of housing bubbles in global cities such as Toronto, Sydney and Hong Kong; a stalled Brexit vote in the British parliament; and the expanding Chinese-American trade dispute all combine to create instability in global stock markets. After the numerous heat waves during the summer, the recent Indonesian tsunami offered yet another stern reminder of the destructive power of natural and man-made disasters and the need for governments to engage in effective disaster mitigation and preparation. Last month saw 15-year old Swedish environmental activist, Greta Thunberg, tell representatives of over 200 nations at the United Nations climate summit in Poland that “since our leaders are behaving like children, we [the children] will have to take the responsibility they should have taken long ago”. Despite a shared commitment to reduce global inequality, the latest Global Inequality Report by Oxfam suggests that in 2018 the “richest 1 per cent bagged 82 per cent of wealth created, whereas the poorest half of humanity got nothing”. Also during the past December, the Yellow Vest mass demonstrations in Paris, France were the latest example of a national anti-elitist movement challenging the status quo by calling for lower living costs, more progressive taxation on global wealth, and the legislation of a living wage. Not least, history books will look at 2018 as the year in which international organisations such as the UN, the EU, the World Trade Organisation, the International Monetary Fund and the North American Free Trade Agreement were all directly challenged by President Trump and his national and international allies as part of an attempt to move away from the post war global order. Indeed, the question what role international collaboration can still play in managing these big policy issues may be the defining one of our era. At Lingnan University, we have made a direct contribution to this question by exploring the role of global policy transfer in governments’ attempts to alleviate people’s financial and employment burdens in their everyday lives. As such, we routinely tell our students about the policy value of comparing social policies across historical, territorial or cultural lines. This is because it is only through comparison that we fully understand what makes the contemporary policy issues we face, or the policy discourse we engage in, similar or special to other times or locations in world history. As the old saying goes: do we really know ourselves, if we only know ourselves. This is true in our personal lives as much as it is for how we assess the laws our policy makers implement. At the same time, we also instruct our students to be careful when evaluating government projects to borrow lessons from “good practice” examples implemented by their international partners. Policy makers typically do not have the luxury to simply ‘copy & paste’ policies from elsewhere because the effectiveness of those policies typically relies heavily on the specific context in which they operate. Put differently: simplistic calls for Hong Kong housing policies to become more Singaporean, or Hong Kong family policies to be become more Scandinavian more often than not are doomed to lead us into a dead end. As part of this, the number of social protection schemes in the Global South increased from only 1 in 1993 to 150 in 2015 according to the latest release of the United Nations’ Social Assistance, Politics, and Institutions (SAPI) database. In East and South East Asia alone, the number of income transfer schemes for the poorest members of society increased from 13 to 23. Higher social protection spending in the poorest countries is thereby shown—time and again—to be related with better health outcomes for children, stronger local economies, improved social networks, and higher social mobility, especially if they are combined with business incentives such vocational training, and access to capital and financial services. Universal coverage in old age pensions, so heavily debated in Hong Kong, has already been achieved by a whole range of middle and low income countries, including Bolivia, Botswana, Brazil, Lesotho, Mauritius, Mongolia, Namibia, South Africa, Timor Leste, Trinidad and Tobago, and Tanzania. The cost of universal cast transfers for some 700 million children, pregnant women, persons with severe disabilities and older persons – nearly 10 per cent of the world’s population – is judged by the International Labour Organisation to require only 1.1 per cent of what the rich G20 nations spent to bail out the financial sector in the wake of the 2008 financial crisis. Global ideas of social protection have certainly travelled to Mainland China, whose national Dibao programme has fast become the world’s biggest social assistance scheme offering cash benefits for some 50 million recipients at a cost of roughly 0.14 per cent of GDP. Meanwhile, in Hong Kong, Finance Minister Paul Chan Mo-po has made recent headlines by warning that although “the government will [again] have a surplus this financial year” “public resources are not unlimited”. Some have interpreted these statements as a thinly veiled hint that fewer financial measures to support Hong Kong’s most disadvantaged will be forthcoming. The jury is still out whether this interpretation of the Finance Minister’s recent statements is justified and will be proven to be correct. What seems clear, however, is that given the regional and international trends of governments embracing social investment strategies with affordable social protection policies at the centre, any potential stance of Hong Kong policy makers to limit the expansion of social protection, or reverse recent achievements by allowing existing policies to ‘drift’, would sharpen Hong Kong’s image as a relative outlier in global perspective. This entry was posted in Uncategorized on January 17, 2019 by stefan-kuehner. Extreme weather events around the globe – what’s Social Policy got to do with it? 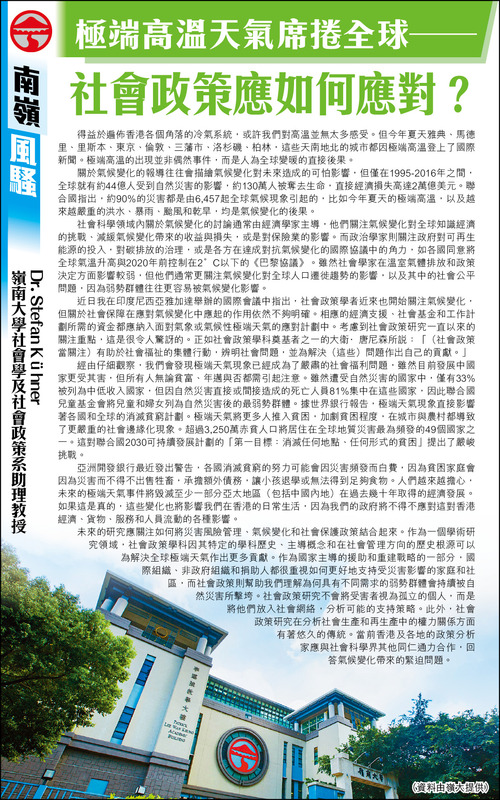 Appeared in Sing Tao Daily. This entry was posted in Uncategorized on September 6, 2018 by stefan-kuehner.